I guess people hate fish. They say things like, “How’s the fish? It isn’t fishy, is it?” I can’t imagine anything worse than the name of a thing being its own pejorative. Apparently we even dislike people in the fish business. “Monger” just means a “dealer in a specified commodity” but nowadays it’s only used to denote those in the “war”, “whore”, and “fish” trades. Seriously? We’ve lumped seafood merchants in with that crowd? Not even lawyers get the monger moniker. I can only imagine that the missing Mr. Paul must have taken his own life in shame leaving Mrs. Paul with the fishstick business and that horrible label, “fishwife”. Likewise, when people give a thing the preface “Mc” you know they’re denigrating it. The practice might have started as simply a way of saying that a thing is basic, convenient, inexpensive and standardized like a McDonald’s restaurant but, for example, calling USA Today a “McNewspaper” is not a compliment. 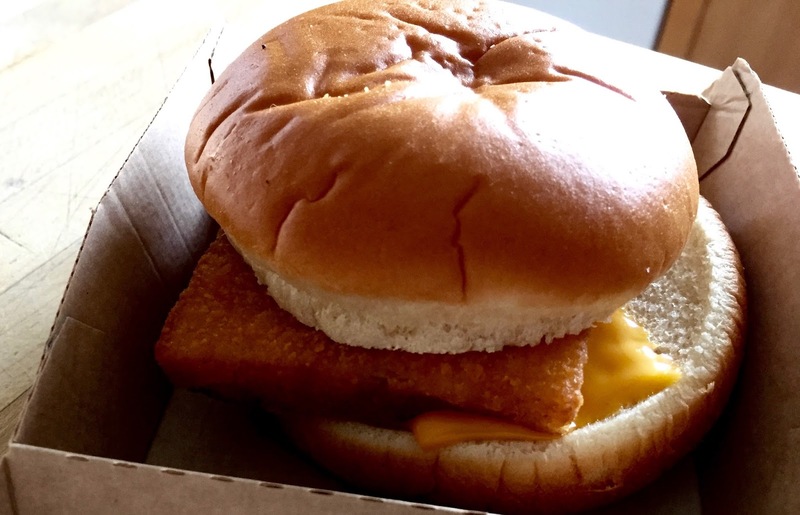 There’s no more humble a fast food sandwich than the lowly McFish. Just look at it. Plain bun, mild tartar sauce, a patty that’s barely a glorified fishstick and some cheese. What the hell? Cheese? On fish? I think McDonald’s might be the only place in the world where cheese comes standard on a piece of seafood. But the thing is, the McFish is good. It's really good. Somehow the iffy ingredients manage to transmogrify into something greater than the sum of its parts. Ol’ Lou Groen might have just been trying to separate the pious from their hard earned dollar but what he actually created was some kind of neigh-religious miracle. I mean, the McFish ain’t water-into-wine but, given the base ingredients, I’d have to say it’s pretty darned close.